Yamaha Motor’s Compact Water Purification System 'Yamaha Clean Water Supply System' in Purwakarta, Indonesia - News Releases | Yamaha Motor Co., Ltd.
IWATA, January 16, 2014 - Yamaha Motor Co., Ltd (Tokyo: 7272) announced today that the 'Yamaha Clean Water Supply System', a compact water purification system for emerging markets, has been installed in Purwakarta, West Java Province, Republic of Indonesia, and a handover ceremony hosted by the Mitra Mandiri Indonesia Foundation was held on January 16. Apart from test site, this is the fourth site this product installed in Indonesia. In order to improve the lifestyles of residents who are living without safe water for drinking and House use, the Indonesian NGO Mitra Mandiri Indonesia Foundation applied to the Embassy of Japan in Indonesia in Jakarta regarding its 'Water Infrastructure Project in Purwakarta, West Java Province', which develops water supply systems including constructing pumping facilities, installing water treatment systems, and laying piping. 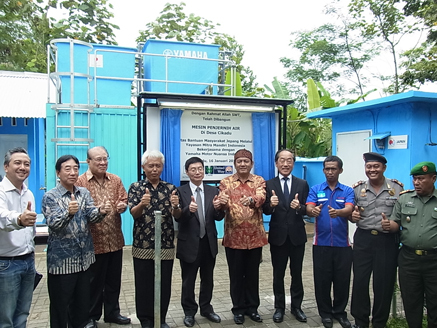 The 'Yamaha Clean Water Supply System' was chosen as the water treatment system for this initiative. The 'Yamaha Clean Water Supply System' is a water purification system aimed at people in emerging markets struggling to obtain clean drinking water. It features a simple construction based on the natural purification function 'slow filtration', and as it requires no filter replacement or maintenance by specialist technicians, its ease of use through being operable by residents of emerging markets themselves is highly rated. The highly-filtered water it produces has not only helped to increase people's awareness of hygiene, but in several villages where the system has been introduced, survey results have shown that incidences of diseases such as diarrhea and fever have in fact fallen significantly. Moreover, as women and children are relieved of the laborious task of drawing water, they have more time for study and productive activities, and as the system has enabled village development through new businesses such as water delivery, it has brought many changes to residents' lifestyles. Including this case, the system has now been installed in two locations in Africa and six locations in Southeast Asia for a total of eight units, and a further ten or so projects are now underway in countries such as the Côte d'Ivoire, Benin, and Ghana.